Introducing the HydroChan mascot who in fact is a Groundhog. Happy GROUNDHOG DAY! 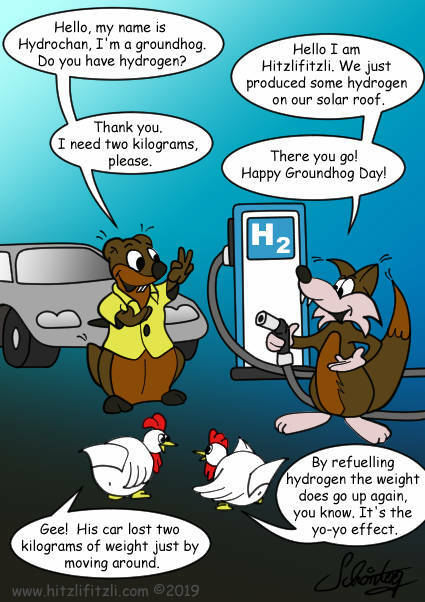 HydroChan drove up in a hydrogen car to ask Hitzlifitzli, the fox, and some chicken for some hydrogen. Hitzlifitzli can gladly satisfy the wish. It is time to enter the WHO IS WHO in the World of Hydrogen. Mortimer is my name, and HydroChan is my nickname when I drive hydrogen cars. the name is short for “Hydrogen Challenge”. When I drove to Amsterdam in February 2016, I coined this term. Now, the name HydroChan is officially given to the groundhog on GROUNDHOG DAY who represents me, who accompanies me and who guides me. You will see (in future blogs). I am who I am. The Energytours-Website is a mix of pictures and texts recollecting my experiences and memories while dealing with elements of the World of Hydrogen. My driving profile is to go for (1) long distances, (2) test cars in Winter time, (3) do something cultural and use emission-free public transport. Of course, I am a fan of electric mobile solutions with two and three wheels as well; but a separate section on that will follow one fine day. This is an interesting fox, seen on the right side in the picture above, who has experience with fuel cells and there are many cartoons that have appeared already sofar. Its creator (see below) and myself, decided to introduce Hitzlifitzli and HydroChan to one another in a cartoon marking HydroChan’s first comic appearance … apart from myself. Armin Schöntag from Weichs and myself have known each other for quite a number of years. Our passion for hydrogen and fuel cells kept the dialogue going. Him designing the HydroChan mascot sparks a beginning of some wonderful stories, and we are both eager to see what shape it will take. Let’s see. They are our friends. You got to have chicken in a cartoon. But, who are they? They are hydrogen chicken. If you like to add anything, you are welcome to. Please write to Armin or Mortimer.